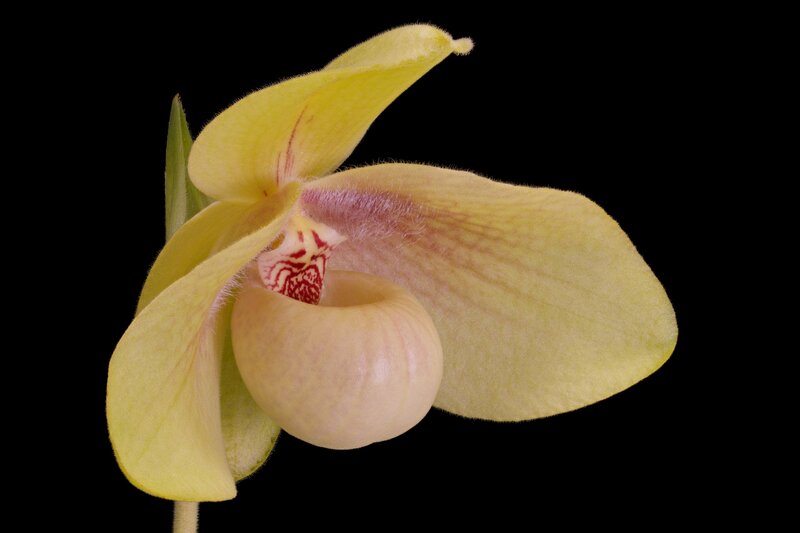 Discussion in 'Orchid Species' started by pcolman, Jan 27, 2018. I've been eagerly awaiting this flower since I noticed it was in sheath maybe 4 or 5 months ago. First bloom seedling, the flower is about 5" across. It is fragrant. I find the fragrance pleasant, somewhat reminiscent of the fragrance added to talcum powder. 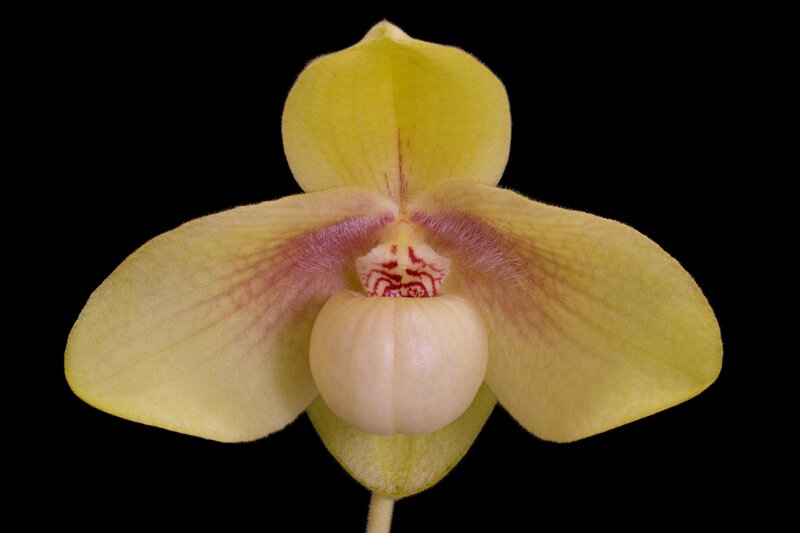 If anyone is familiar with it, I find it smells identical to Trichoglottis pusilla. Like many paphs, the inside of the pouch is quite boldly patterned, in this case, full of maroon spotting. Growing it pretty shady, moist in summer, somewhat less so in winter. Intermediate temps, but 50 degree winter nights. DanaRaluca, Kipper, slippersnpitchers and 5 others like this. It is definitely slow growing. Though the roots apparently not so much so. I repotted in early December (In spike, I don't listen) and the roots had grown in enough in the past year that they were circling the edge of the pot and pushing the plant upwards about half an inch. I had to pot up. Even I want one of those!!! Great color on that one. Good job. 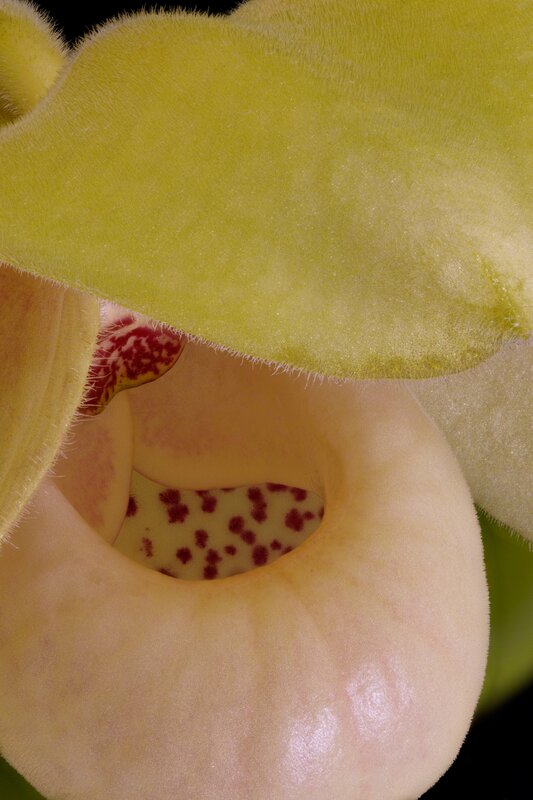 When I photographed Paph. hangianum I thought is was fully open, but apparently it wasn't done growing. It looked larger, so I measured again It's about 5½" across now. FYI, the flower lasted almost exactly a month. 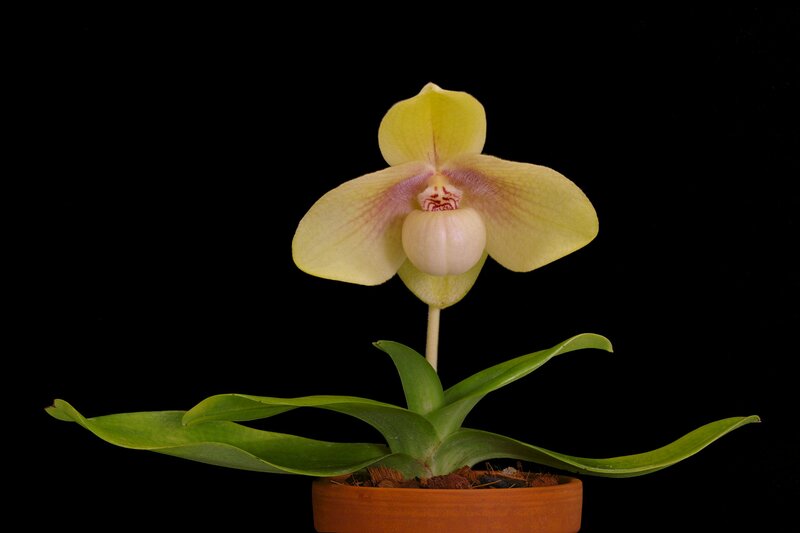 As a paphiopedilum philistine, I'm curious...I saw one of these on a Canadian vendor website advertised for $5000. Is this because of rarity, or breeding potential, or something else? Unless it's a division of a newly awarded clone, they're nuts. Not awarded, as far as I can tell. It's got better form than mine, and the markings around the center are a darker red, though I like the staminode on mine better. But I don't think it's about $4850 better. I know that this thread is a little bit old, but can you, please, share some cultural advices with us? What growing media do you use? What temperatures do you have? What is your watering and feeding regime? ... any other advices are more than welcomed: I have a hangianum, too, but mine seems to never grow. Not even a single root or leaf, so for sure I'm doing something wrong. I grow it intermediate, but give it 50° winter nights. Dilute fertilizer every watering, except for winter, almost no fertilizer then. I'm growing it pretty shady. If the leaves are turning yellowish it's probably getting too much light. I water it twice a week in summer and once a week in winter, but it's in a clay azaelea pot, so it drys pretty quickly. You could probably halve that watering in a plastic pot. I've grown it in CHC with coco peat and bark with peat. Perlite, charcoal, and some oyster shell added to both. A few pieces of lava rock as well. It grew about the same in both. It's currently smaller than it was in the photo, because it dropped two older leaves. I gave it too much light when I switched to LED lighting before I figured things out and this probably accelerated that. I has put out two new growths. Regardless of everything else, it is a slow grower. It takes a long time to get a multi-growth plant. Are you giving it KelpMax and Concentric Ag Garden Solution regularly (monthly)? That will accelerate the formation of multiple growths. I tried to grow mine in s/h, in a glazed clay pot. Maybe it was not such a good idea. Or maybe I just water it too often, because since April it didn't put out any root (or leaf), and even worse, a few roots are rotten by now. Maybe I should switch to a CHC-based media. Yes, and it does have two new growths, but it is a by nature a slow growing species.